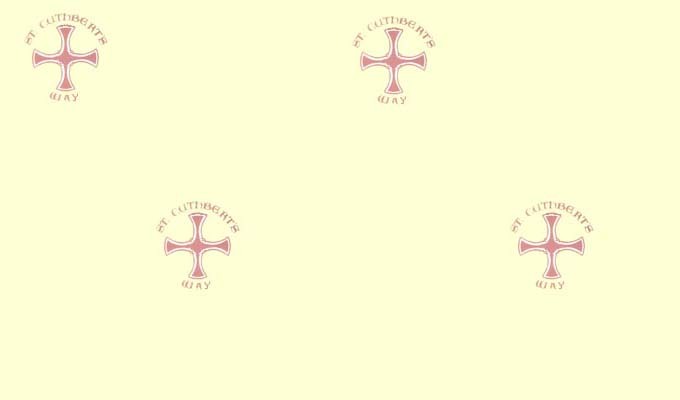 St Cuthbert's Way - Harestanes to Yetholm. This section is 27 kilometres in length and has a maximum ascent of 400 metres. It is one of the more arduous and will require in excess of 6 hours walking. You go over the highest and midway point (50km) of the complete route at the summit of Wideopen Hill. The route restarts very close to Harestanes Visitor Centre and resumes with the Dere Street waymarkers heading south. The route however is far from straight until the Teviot River and the Jedwater are crossed. 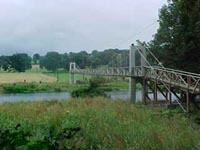 The Teviot has by this bridge run the majority of its length before entering the Tweed at Kelso. 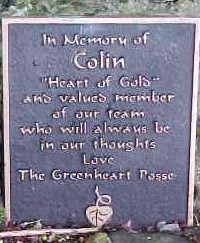 It is however relevant to todays walk with latter reference to one of its tributory the Kale. Another connection is with the hills to be encountered. It is thought that the closeness in name and location of the river to the Cheviots is no accident. Dere Street is now very clear and is the footpath to be used for the next few minutes. At the top of a rise turn into the wood on the left, this is a revision to the original routing as defined in 1996. The path through the wood is almost straight starting along the line of pine trees, then passing through the centre of a narrow strip of silver birch trees. 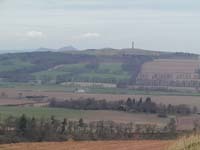 There are from this wood some dramatic views to the north over the Teviot Valley to Peniel Haugh and the Waterloo Monument. 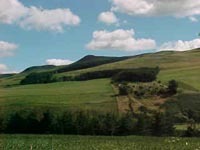 The Eildons can be seen in the distants. 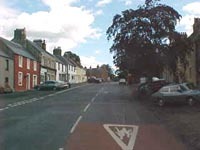 Image 1 : Point of entry from Dere Street on left. 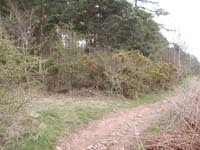 Image 2 ; Start of path through wood. Image 1 : Waterloo Memorial from Way. 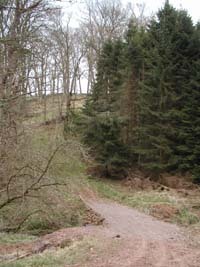 Image 2 ; Path through wood. Towards the end of the narrow forest the path enters a side of a field on the right of the wood, now following the edge of this field and an adjoining field until re-entering the woodland strip close to the road. Turning south and up the road you quickly reach another bend in the road. At this point the route carries straight ahead along a track which then dog-legs and descends to the Oxnam Water. Cross the new wooden pedestrian bridge turning to the left and by clearly defined waymark posts climb up towards Littledeanlees. 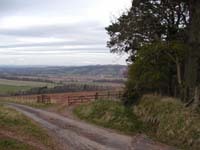 Image 1 : Looking down road to Littledeanlees. From Littledeanlees the route is an ascent along a farm track to a point next to a wood, this being shown on the adjacent photographs, the view being back down towards Littledeanlees and through the gate into the wood. There now follows a very pleasant walk through a narrow wooded section with some fine old hardwood trees. There are yet further attractive views to the north over the Teviot Valley. 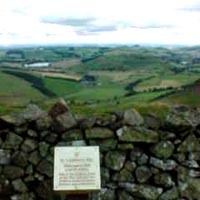 The photograph is taken from a point along this section and is to the south east towards Brownrigg Farm and the Cheviots, parts to be reached later in the walk. The track is in regular use and ends at the minor road, at this point the route turns right. The road section is short before reaching a "T" junction, turn left and almost immediately right along the fence line of Brownrigg's Farm. The walk follows the edge of two fields as it works it way into the Wooden Glen which lies to the east of the farm. Descend into the Glen then climb steeply out the other side making for the left hand side of the wood. Follow the line of the dyke to the eastern corner of the wood . Exit the wood and head to the corner of the next tree plantation, keeping the dyke now on the right hand side. Enter the next wood known as Fox Covert. Continuing through Fox Covert in an easterly direction keeping the plantation edge close on the right hand side. On exiting the wood the path keeps to the edge of another field, bearing left at the corner and walking another 100 metres before reaching a stile built into the drystone dyke. Cross the stile and make up the edge of the field to the conifer wood, this is called Long Plantation. Keeping to the north west and north east boundaries of the plantation walk up to the Cessford Moor farm track. At the farm track the revised route joins the original Way on Cessford Moor. 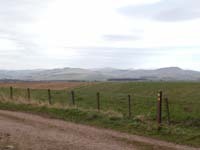 Turn left and descend along the clearly defined track into Cessford enjoying the views over Cessford Castle to the Cheviots. Image 1 : Point of entry from Deer Street on left. The landscape in this area of the Kale Valley has change significantly over the years. 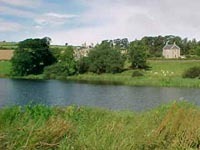 Long before the founding days of Cessford Castle there was a Loch or Lake close by that run from Morebattle to Eckford. This perhaps explains the somewhat unusual and open location of the castle which would have orignially been sites next to water and marshland. 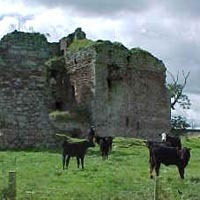 The castle built around 1450, is now a ruin but was the home of the Kers, the direct ancestors of the Duke of Roxburghe. The walk is now on road until shortly after Morebattle at the crossing of the Kale River. 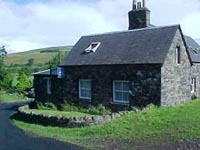 The village of Morebattle has a hotel, several B&B's and a few shops where refreshments can be purchased. 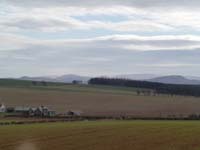 Almost immediately after leaving the Morebattle to Town Yetholm road you get a wonderful view of the Cheviot hills that will form the second part of the days walk. The Kale river is orignially thought to have flowed into the Bowmont Burn, but with the change in the Lake the route altered. 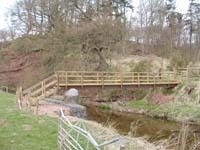 Having crossed this river by a wooden bridge the main ascent of the walk lies ahead past Grubbit Law and onto the ridge that leads to Wideopen Hill. 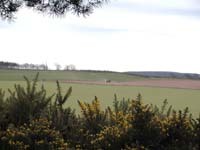 From here the views in all directions are breathtaking, so do not be tempted to take the short route to Town Yetholm by the valley. 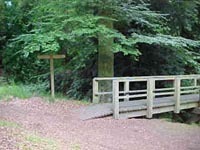 The walk remains on the high ridge to Crookedshaws Hill then descends into the Bowmont Water Valley close to Primsidemill. The final stages of the walk take you past the Romany Marsh a small wild life reserve. You would hope to see a variety of wading birds and ducks at this location. 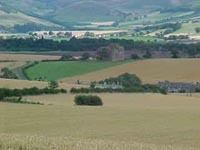 The twin villages of Town & Kirk Yetholm are on either side of the Bowmont Water. It is said that the churchyard was the burial ground of a number of Nobles killed at Flodden. This is also the home of the Scottish Gypsies, traced back to James V with a writ in 1540 referring to Johnne Faa. The last Gypsie Queen, Ester Faa Blytte, died in 1883 ending the "royal" line. The Gypsie Palace still remains and is passed on day 3 of the walk.